Or at your travel agency or tour operator. Free entrance tickets for accompanying teachers (1 for every 10 paying schoolchildren). 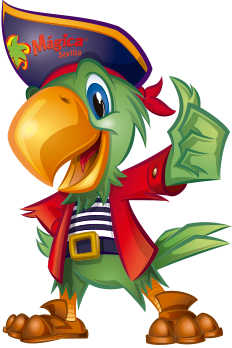 Free access to Agua Mágica for teachers of groups with Isla Mágica + Agua Mágica booking (1 for every 10 paying schoolchildren). Free lunch for teachers of groups with Entrance Ticket + Lunch booking (1 for every 10 paying schoolchildren). Wi-Fi Area in El Fuerte. Individual entrance ticket discount vouchers for ulterior visits of teacher and their families during the 2018 season. and free access to Isla Mágica for bus drivers. Visit Isla Mágica with the Parents Association on weekends during the school year benefiting from the same school group prices for children and school-age teenagers. Profesorado gratis y hasta 3 acompañantes por 14,50€ cada uno. Para poder asistir y obtener su entrada gratuita y descuentos, es imprescindible inscribirse en el formulario de la web y acreditarse en las taquillas del parque con el Carnet DIPA o cabecera de la nómina + DNI. 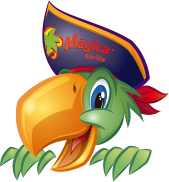 Isla Mágica, Seville’s theme park, has got more than 21 years of experience offering specific programmes for school groups in which schoolchildren have experiences the exciting formula of learning while they enjoy our attractions, shows, audiovisuals and theme settings. Isa Mágica facilitates the educational use of the visit thanks to a comprehensive and renewed “Educational Guide” for teachers, approved by the Regional Ministry of Education of Andalusia. Learn about the history of the famous Portuguese sailor Fernando de Magallanes. Know the story on which the setting of Isla Mágica is based. Study the principle of conservation of energy thanks to the park’s attractions. Everyday life in the Golden Century. Who was who and how did they live at the time. Learn about how this disease spread down, and how did it affect the population of Seville in the 16th century. Find out about the famous 16th century astronomer and the heavenly bodies that move around the Sun. Find out about the Italian physicist and astronomer and learn how to build a basic telescope. The most comprehensive one until 1573. German astronomer and first woman to discover a comet. Written by Miguel de Cervantes within his work Exemplary Novels, 12 short novels written by the author in the late 16th century. The dramatic progress of science and technology since EXPO'92. Find out about the history of Seville’s theme park since its beginning. Nursey School groups have a special dedicated area for the smaller ones. The visit includes a morning visit in which children enjoy the attractions of La Fuente de la Juventud. Every pupil will receive an amusing “Activity Notebook” to continue this unforgettable experience back at nursery school. This programme includes: Entrance Ticket to Isla Mágica + an Activity Notebook + One free ticket for teachers or educators for every 10 pupils. Full Day: 11:00 – 23:00h. Full Day: 11:00 – 24:00h. Full Day: 11:30 – 18:30h. Full Day: 11:30 – 20:00h. Full Day: 11:00 – 22:00h. Full Day: 11:00 – 19:00h.